The founding of Clark Publishing Company in late 1947 and the publication of the first issue of Fate in the spring of 1948 weren't just by happenstance. They were a result of the events of the first summer of flying saucers, which had its beginning on June 24, 1947, when Kenneth Arnold, a private pilot flying out of Chehalis, Washington, saw over Mount Rainier a flight of nine unidentified objects that "flew like a saucer would if you skipped it across the water." (1) Within a few days--in some places within a few hours--of Arnold's story getting out over the newswire, flying saucer fever seized Americans of all stripes, and people began seeing these unexplained aerial objects everywhere. Kenneth Arnold was an average joe and not a crackpot of any kind. Observers found credence in his story. Around the middle of July, he received a letter from an outfit called The Venture Press, presumably based in the Chicago area. The sender asked him to investigate a supposed sighting of flying saucers over Maury Island, located about three miles north of Tacoma, Washington. And not just a sighting but a crashdown--a partial crashdown to be sure, one of debris that had supposedly fallen from a damaged craft, but one that nonetheless might yield physical evidence of the existence of flying saucers. 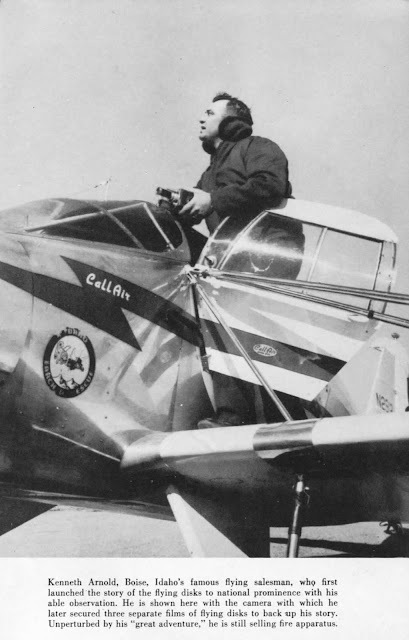 What's more, the sighting and crashdown of debris were supposed to have taken place on June 21, 1947, three days before Arnold's sighting over Mount Rainier and about two weeks before Mac Brazel is supposed to have found evidence of a crashdown near Roswell, New Mexico. In other words, the incident--now known as the Maury Island Incident--if found to be based in fact would establish precedence for its two witnesses. Keep that thought--precedence--in the back of your mind for a while. It will come up again before too long. So, fake name and fake company. In any case, whether Fate was in the works before the first flying saucer sighting or not, Palmer and Curtis--Palmer especially, I think--must have seen a potential gold mine in the subject. And when Kenneth Arnold agreed to investigate the Maury Island Incident, Palmer uncovered another rich vein, for the incident introduced into the flying saucer story sensations of fear, paranoia, and conspiracy that have never really been shaken off in the seventy years since. The incident also brought on one of the first investigations of flying saucers by the U.S. government and resulted, tragically, in the first deaths associated with the phenomenon. Here again is the theme of fear, paranoia, and conspiracy, especially conspiracy supposedly carried out by the U.S. government and against believers in flying saucers. 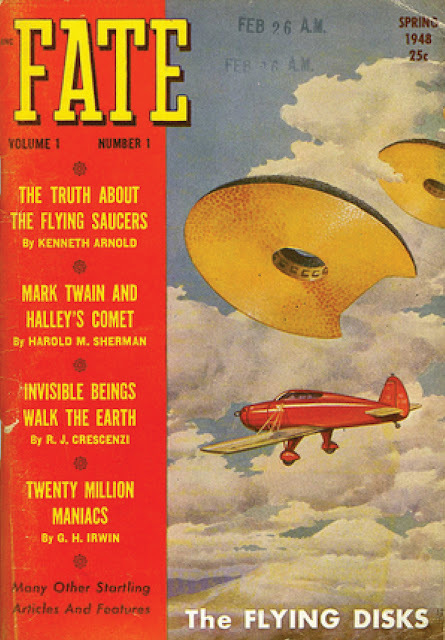 The cover of the first issue of Fate capitalized on the flying saucer craze as it approached the beginning of its second year. The cover story is "The Truth About Flying Saucers" by Kenneth Arnold, while the cover illustration, captioned "The Flying Disks," shows Arnold's bright red Call Air A-2 in flight above Mount Rainer and overshadowed by three large, otherworldly craft. 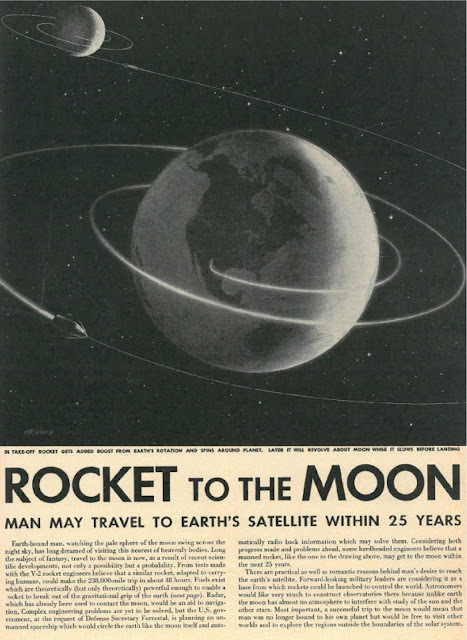 The magazine was a hit among those caught up in the phenomenon. John Keel reported that at the first flying saucer convention, held in New York City in the fall of 1948, most of the attendees (there were only about thirty) clutched copies of Fate as they shouted and argued their positions. (4) In case you're wondering, Fate is still in existence and is closing in on its seventieth-anniversary year. Year after year beginning in 1947, flying saucers fascinated the American public, and year after year, flying saucer fans kept up on the latest news in Ray Palmer's several titles, including Fate, Mystic Magazine, The Hidden World, Search, Ray Palmer's News Letter, and Forum. By John Keel's estimation, Palmer was the man who invented flying saucers. What has largely been forgotten, however, is that he was also the prime promoter of a mystery that served more or less as the forerunner to flying saucers. 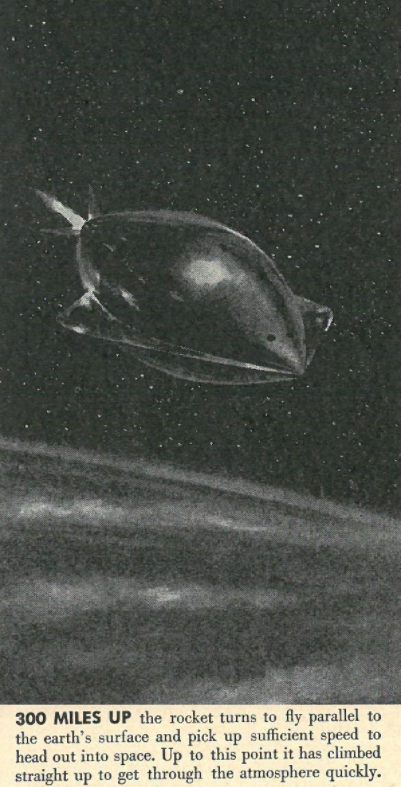 This was the so-called Shaver Mystery, which excited, perplexed, and angered readers of science fiction from its beginnings in the mid 1940s until it was overtaken by spacecraft from another world. (1) From The Coming of the Saucers by Kenneth Arnold and Ray Palmer (Boise, ID, and Amherst, WI: Authors, 1952), p. 11. (2) From The Man from Mars: Ray Palmer's Amazing Pulp Journey by Fred Nadis (New York: Jeremy P. Tarcher/Penguin, 2013), p. 116. (3) From Nadis, p. 117. (4) See Nadis, p. 116. 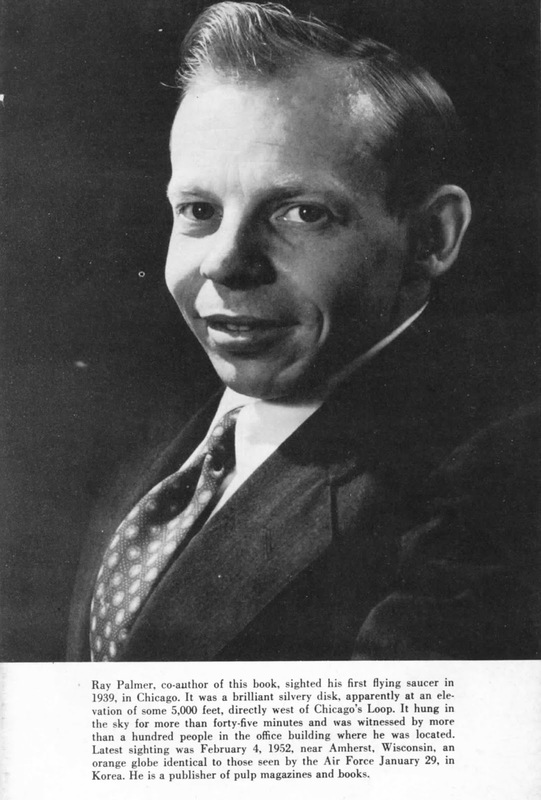 Kenneth Arnold (1915-1984), who made his fame by seeing and reporting the first flying saucers. From The Coming of the Saucers by Kenneth Arnold and Ray Palmer (Boise, ID, and Amherst, WI: Authors, 1952), p. 161. Raymond A. Palmer (1910-1977), the man who invented flying saucers and kept them in the public eye for almost thirty years. As with Gray Barker, his name is suggestive: a palmer was a Christian pilgrim of the Middle Ages, in other words, a devout believer. On the other hand, someone who palms cards is a cheat or a grifter. On the other, other hand, Ray, as in ray of light, suggests something pure, warm, illuminating, heavenly, or in the science-fiction sense, a deadly force. From The Coming of the Saucers by Kenneth Arnold and Ray Palmer (Boise, ID, and Amherst, WI: Authors, 1952), p. 163. 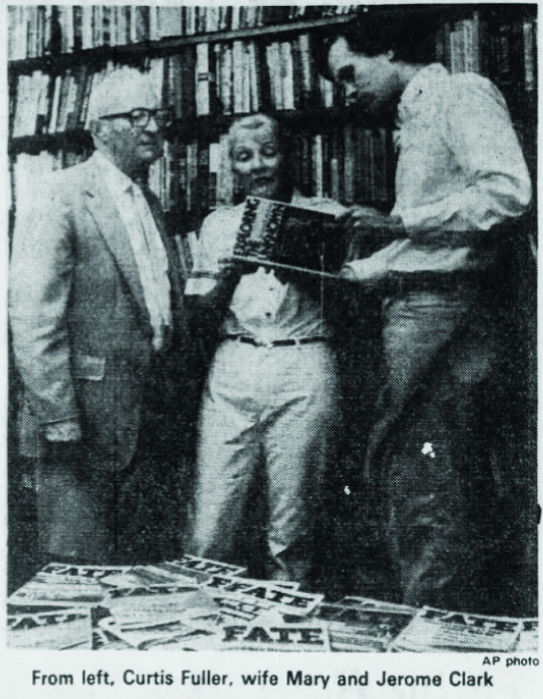 From left to right: Curtis Fuller (1912-1991), his wife Mary Fuller (dates unknown), and Jerome Clark (b. 1946), all on the staff of Fate magazine in 1982 when this AP photo was published. Fuller and his wife bought out Ray Palmer in 1955 and ran Fate for decades afterwards. Fate, Spring 1948, the first issue of a magazine that continues to this day, nearly seven decades later. On Friday evening, September 12, 1952, a visitor from another world came to West Virginia. Soon after dubbed the Flatwoods Monster, the Phantom of Flatwoods, the Green Monster, and the Braxton County Monster, the visitor put a scare into residents of Flatwoods. Within days, journalists and other investigators were roaming over town and country in search of witnesses, evidence, and clues. 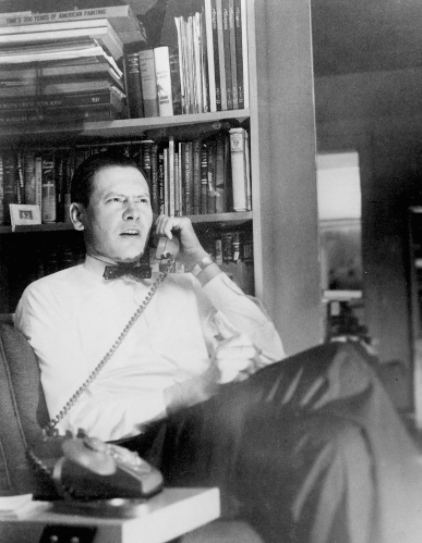 Gray Barker, a Braxton County native then living in Clarksburg, was among them. He arrived in Flatwoods after work on Friday, September 19, only a week after the sighting of the monster. He had in hand an assignment from Fate magazine: 3,000 word and a few pictures with a Monday deadline. That weekend, Barker interviewed some of the witnesses of the event. He also ran into Ivan T. Sanderson, another investigator of strange and unexplained phenomena. 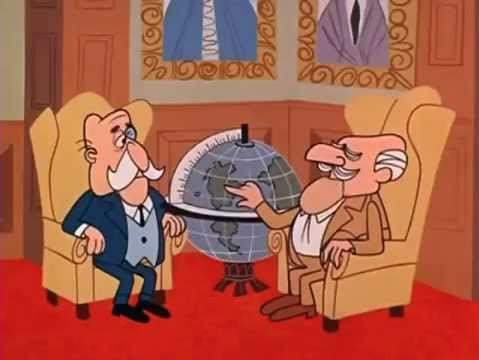 The two men collaborated in their investigations in that last weekend of the summer of 1952, the closing of what in journalistic circles is sometimes called "the silly season." Both got their stories. It was likely the first time they had met. 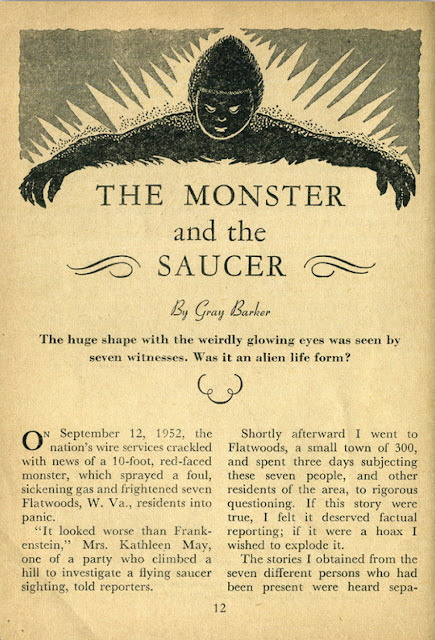 Gray Barker's story of the encounter with the Flatwoods Monster, entitled "The Monster and the Saucer," was published in Fate in January 1953. By then, Barker was already in touch with still another investigator, Albert K. Bender, Jr., of Bridgeport, Connecticut. Barker first wrote to Bender on November 20, 1952, after having read a letter by Bender that was published in the December 1952 issue of Other Worlds Science Stories. Bender's missive to Other Worlds announced the formation of the International Flying Saucer Bureau and invited interested parties to join. In writing, Bender also offered an honorary membership to the editor of Other Worlds. Although the wording of his response is ambiguous, the editor seems to have accepted the honor. His name, by the way, was Raymond A. Palmer, also known by his initials, Rap. Born in Milwaukee, Wisconsin, on August 1, 1910, Palmer was a writer, editor, and publisher of fact, fiction, and things from the twilight zone between them. Palmer was badly injured as a child. In search of solace and escape, he read science fiction and fantasy, then created with Walter Dennis the first science fiction fanzine, The Comet, published in May 1930, when he was only nineteen. With the June 1930 issue of Wonder Stories, Palmer became a professional author of science fiction. He also managed to slip his first name into the title of his first published story, "The Time Ray of Jandra." Palmer was not quite thirty when he landed a plum assignment as editor of Amazing Stories. The June issue of 1938 was his first. Eleven months later, in May 1939, he took on additional duties as editor of the new Fantastic Adventures, also published by Ziff-Davis of Chicago. He remained as editor through the December 1949 issues of the two magazines and was succeeded in the following month's issues by Howard Browne. Palmer wasn't out of of work, though, for he had already started as editor of Other World Science Stories in its inaugural issue of November 1949. More commonly known as Other Worlds, the new publication was digest-sized in keeping with a growing trend in the pulp-fiction market. The Magazine of Fantasy and Science Fiction also began as a digest-sized publication in the fall of 1949. (1) Astounding Science-Fiction had started the trend in November 1943. Weird Tales didn't follow suit until September 1953. Other Worlds was published by Clark Publishing Company of Evanston, Illinois. Although the magazine was new in late 1949, its publisher was not, for Clark Publishing Company had been formed about two years before, in late 1947, by Raymond A. Palmer and Curtis Fuller. Their purpose was to publish a new kind of magazine, a magazine to look into the strange and unexplained facts on the fringes of science. They called it Fate. (1) The first issue was called The Magazine of Fantasy. 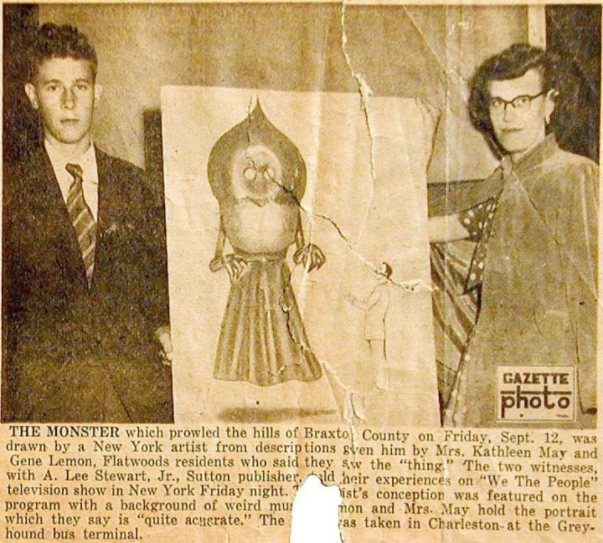 A clipping from the Charleston, West Virginia, Gazette from Tuesday, September 23, 1952, page 3, eleven days after the sighting of the Flatwoods Monster in Braxton County. Kathleen May and Gene Lemon were the only two adults to see the monster. All of the other witnesses were children. A week after the sighting, Mrs. May, Gene Lemon, and A. Lee Stewart, Jr., co-editor of the Braxton Democrat, appeared on the NBC television show We the People in New York City to talk about the incident. Note that the photograph above was taken at the Charleston bus station. Presumably, that was on the trip to or from New York. I don't know who drew the picture the two eyewitnesses are holding here, but I believe it was also shown on We the People. It may have been drawn by an artist for the show or by a newspaper artist. 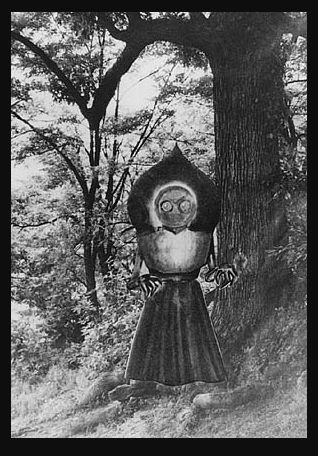 A photo-montage of the Flatwoods Monster, ostensibly created by Gray Barker. However, Barker admitted in another context that he was not an artist. If he in fact created this image, he seems to have superimposed the artist's drawing from above onto a photograph of a woodland scene, with a large white oak tree on the right. I don't whether the photograph of the oak tree was shot at the original location of the sighting of the Flatwoods Monster or not. In any case, in the sixty-five years since the monster came to Earth, the tree has died and rotted. There may be little left of it. Barker wrote his account of the encounter with the Flatwoods Monster for Fate magazine. It was published in January 1953. I like the drawing of the monster shown here. Unfortunately, I don't know the identity of the artist. Asa Lee Stewart, Jr., known as A. Lee Stewart (1930-1998), was co-editor of the Braxton County Democrat and the first reporter on the scene after the encounter with the Flatwoods Monster. According to Gray Barker in Barker's book They Knew Too Much About Flying Saucers (1956), "He arrived about half an hour after the incident." (p. 28) A few weeks later, Barker stopped in at Stewart's office. "Stewart chuckled as he held up an 8 x 10 photo, attached to a publicity release from Collier's magazine. 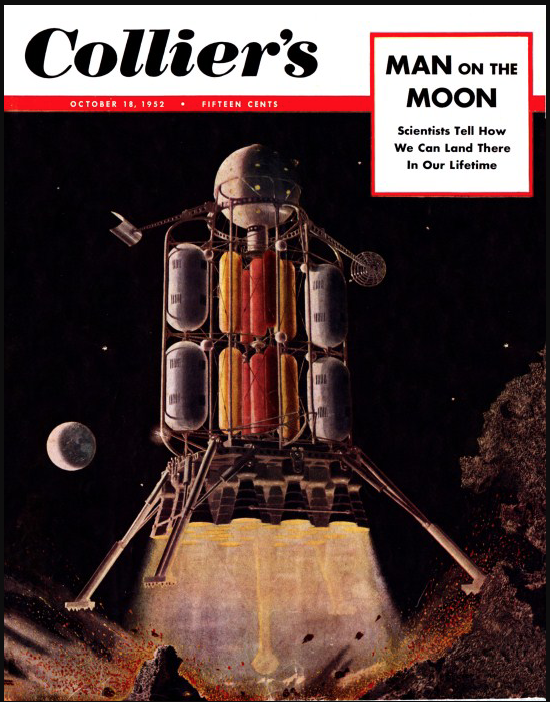 The issue of October 18 was to contain the story of how a moon rocket would be constructed in the future, and the photo was [of] the art work which was to appear on the cover." (p. 30) Stewart, then, would seem to have been the first to notice a similarity between the eyewitness descriptions of the Flatwoods Monster and the cover art for Collier's, October 18, 1952. (Rev. S.L. Daw of Washington, D.C., an associate of Albert K. Bender, Jr., would write about the similarity in the January 1953 issue of Bender's Space Review.) Again, I don't know the identity of the artist. I also don't know whether the October 18 issue would have been on the newsstand as early as September 12. It doesn't seem likely to me, given that Collier's was a weekly rather than a monthly. On the evening of the incident in Flatwoods, the issue whose cover is shown above would have been still five weeks--and five issues--out. Not long ago, I was watching the 1950 science fiction film Rocketship X-M when I saw this scene: actor John Emery as physicist and rocketship designer Dr. Karl Eckstrom at the chalkboard as he explains his creation to the astronauts who are about to be shot into outer space. I was struck by the resemblance of the drawing to the Flatwoods Monster, especially to later mechanistic interpretations of the monster's appearance. According to Wikipedia, the design of Rocketship X-M was based on drawings that had appeared in the January 17, 1949, issue of Life magazine. So in this wondrous age of the Internet, what do you do but look for just those drawings? Five years ago--even a year ago--you might not have found what you were looking for. Now it's another story. And so I found these two images (above and below), illustrations for the article "Rocket to the Moon," predicting a trip within the next twenty-five years. (It actually took twenty.) The artist was Michael Ramus (1917-2005). 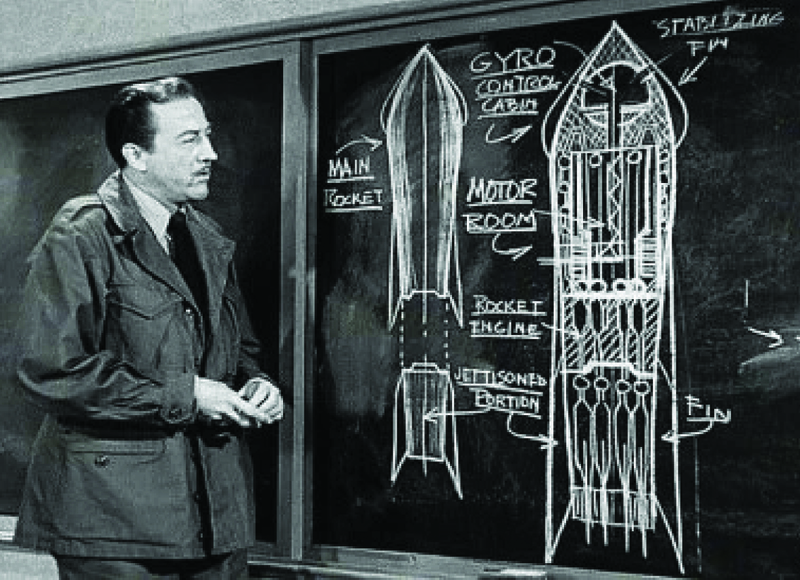 Although they don't offer the best view of Ramus' rocketship design, these images show a craft similar to the one in Rocketship X-M, a movie released a little more than a year later, on May 26, 1950. In any case, as this advertisement from the Beckley, West Virginia, Post Herald from May 9, 1953, shows, Rocketship X-M was still playing at theaters three years after its debut. In other words, it might still have been fresh in the minds of moviegoers. By the way, Gray Barker worked as a movie theater booker. His business was the largest of its kind in West Virginia at the time. So did he book Rocketship X-M at the Pine theater in Beckley less than a year after the Flatwoods Monster incident? Finally, Albert K. Bender's letter in Other Worlds Science Stories, December 1952, page 156. This is almost certainly the letter that prompted Gray Barker to write to Bender on November 20, 1952. 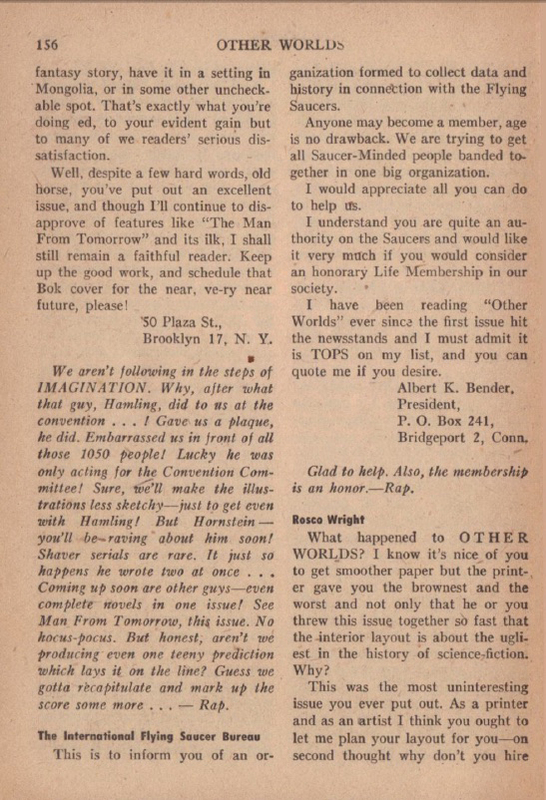 (I don't have access to the October 1952 issue of Other Worlds, but I doubt there was a letter prior to this one.) Barker's letter was his introduction to Bender and to the whole mystery that would soon surround him, including the Mystery of the Three Men in Black. About once a month, I meet with a weird fiction book club to discuss some short works by a given author. In our past two meetings, we have talked about the works of Algernon Blackwood (1869-1951). For our first meeting on Blackwood, we read "The Willows" and "The Wendigo." In our second, we talked about the short stories "Smith: An Episode in a Lodging-House," "May Day Eve," and "The Listener." A theme runs through all of these stories, namely, an encounter with the invisible or previously unseen, usually by way of a kind of crossing over into or contact with worlds beyond on our own. 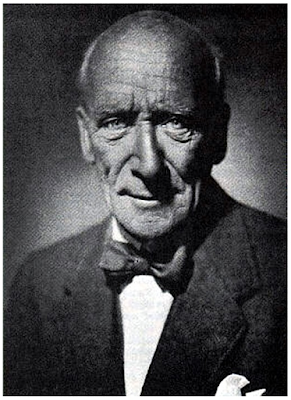 Algernon Blackwood was a mystic and an occultist. Again and again in his stories, he wrote of encounters with the non-material. I hesitate to use the word supernatural, as the weird forces and entities he described in his stories seem less supernatural than simply not of our world: they may obey laws of nature, but those laws are not necessarily the same laws that govern us in our earthly realm. Supernatural also suggests a hierarchy of some kind, with some things in nature and others above it. In Blackwood's stories, there seems to be a unity among all things. He was interested in Buddhism. His stories seem to reach towards an Oriental oneness, of body and spirit, of the material, physical, or earthly realm with the non-material or spiritual realms that actually lie all about us and perhaps also within us. I am, indeed, an absolute materialist so far as actual belief goes; with not a shred of credence in any form of supernaturalism--religion, spiritualism, transcendentalism, metempsychosis, or immortality. Algernon Blackwood was obviously not a materialist. He seems to have believed wholeheartedly in the spiritual or non-material. In reading his stories, I am reminded of the title of a wholly unrelated book, Wonders of the Invisible World by Cotton Mather, for Blackwood seems to have been an explorer of the invisible worlds that adjoin our own or that are, to use a Lovecraftian word, coterminous with it. If only we could expand our consciousness or awareness, we might commune with these worlds. That reaching towards greater consciousness or awareness seems to have been Blackwood's purpose in his stories. Lovecraft admired Blackwood. In a letter to Vincent Starrett, from 1927, he wrote: "Aside from Poe, I think Algernon Blackwood touches me most closely . . . ." He considered "The Willows" "the finest weird story" he had ever read. This admiration came "in spite of the oceans of unrelieved puerility which he [Blackwood] so frequently pours forth." (1) I can't say what exactly was Lovecraft's objection to Blackwood's writing. (2, 3) I assume his accusation of "puerility" to have been directed at Blackwood's mysticism or non-materialism, perhaps more specifically at Blackwood's occultism. Blackwood is supposed to have had a less kindly opinion of Lovecraft's work. In a search of the Internet, I found only a reference to Blackwood's claim that he found "spiritual terror" lacking in stories by his younger admirer. And that brings up another difference between Blackwood and Lovecraft, namely, that Lovecraft was more direct and the threats about which he wrote are more physical than in Blackwood's work. Cthulhu is a monster with height, breadth, and depth. He is a certain color, has a certain anatomical structure, and so on. Yes, he has come to earth from deep space. He has lived countless eons and will go on living for countless more. And he affects the dreams of sensitive people. But he is still a physical being. His body can be cloven by the prow of a fast-moving ship, thus sending him back to slumber in his submarine city. Blackwood's monsters, on the other hand, can't be seen clearly or directly. For example, the entities haunting the willows in the story of the same name are indistinct; they are not clearly defined or delineated. (4) They may leave footprints (or hoof prints) in the sand, they may leave their mark on the poor Hungarian peasant, but they are nonetheless non-material, or at most only partly material. Peter Penzoldt said it best when, in The Supernatural in Fiction (1965), he described Algernon Blackwood's entities as "apparitions." In any case, Blackwood, being a non-materialist, was not bound by the mere physical. The terrors he described extend into the spiritual realm. Lovecraft, more or less his opposite, may have been bound by his materialism, thus his terrors are, on their face at least, only physical. That might be a narrow reading of Lovecraft, though. He may have believed more than he let on. "I was at the time, moreover, in the heavy, unquestioning state of materialism which is common to medical students when they begin to understand something of the human anatomy and nervous system, and jump at once to the conclusion that they control the universe and hold in their forceps the last word of life and death. I 'knew it all,' and regarded a belief in anything beyond matter as the wanderings of weak, or at best, untrained minds." Rest assured that the narrator is relieved pretty quickly of those feelings in his encounters with things from beyond. "I meant [. . .] that you were a very brave man to walk to-night over the enchanted hills, because this is May Day eve, and on May Day eve, you know, They have power over the minds of men, and can put glamour upon the imagination--"
"Who--'they'? What do you mean?" "The elemental beings you have always scoffed at, of course; they who operate ceaselessly behind the screen of appearances, and who fashion and mould the moods of the mind. And an extremist like you--for extremes are always dangerously weak--is their legitimate prey." The fanatic cannot be weaned away from his cause by an appeal to his reason or moral sense. He fears compromise and cannot be persuaded to qualify the certitude and righteousness of his holy cause. But he finds no difficulty in swinging suddenly and wildly from one holy cause to another. He cannot be convinced but only converted. The opposite of the religious fanatic is not the fanatical atheist [. . . .] The atheist is a religious person. He believes in atheism as though it were a new religion. He is an atheist with devoutness and unction. I have that sense, too, that an atheist is a person who very desperately wants to believe in something yet can't bring himself to believe simply in God. In getting back to "May Day Eve," a believer in God would not be so disturbed by his experiences as is the narrator--the believer is already aware of and is in touch with the invisible world. On the other hand, a materialist like the narrator of "May Day Eve" has his whole worldview shaken in any encounter with the spiritual, invisible, or non-material. Even stories like Dangling Man by Saul Bellow (1944) and "Mr. Tripp and Skobol" by Jack Matthews (Chicago Review, Autumn 1959) can be considered rooming-house stories. I am also reminded of Tom Waits' spoken-word recording "What's He Building?" from 1999. I welcome other additions to this list. I'll close by saying that a few years back I wrote a rooming-house story, before I even realized there was such a thing. I encourage everyone to try your hands at the club story and the rooming-house story, and failing that, to write stories of every kind. (1) Quotes are from that same letter to Vincent Starrett. (2) In another letter to Willis Conover, from 1937, Lovecraft called Blackwood's prose style "poor." This comes from a writer who too often alternated between self-conscious faux-archaism and the purplest and pulpiest of prose. I find problems with Blackwood's prose, too, but I think Lovecraft's objection was about something far more serious, to him, than style. See the following note. Note the use of the word puerility again. Did Lovecraft consider belief, faith, feeling, love, emotion--in short anything at all that is at once human and spiritual--to be unacceptably sentimental? 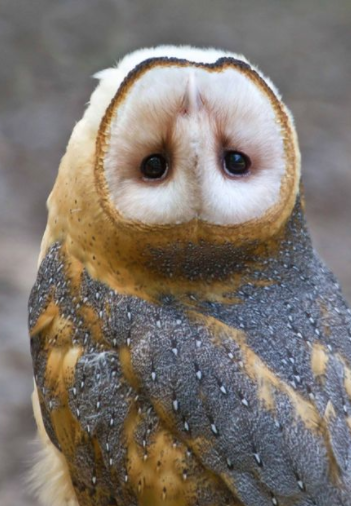 Was that his complaint against Algernon Blackwood? (4) Lovecraft may have admired "The Willows" so much because it is so close to his own conception of beings from beyond time and space that are attempting to break into our own world. The difference is in their nature and motivation, which aren't made entirely clear in "The Willows." Although Blackwood's story isn't quite science fiction, I think it is an early example of science fantasy, a sub-genre in which Lovecraft worked pretty easily. (I would consider "The Call of Cthulhu" science fantasy, although it can be described more easily--and with less precision--as weird fiction. Alternatively, "The Call of Cthulhu" can be considered a story that crosses genres or even defies categorization by genre.) "The Willows" has, without a doubt, an air of the mythological, folkloric, and supernatural. At first glance, it is a fantasy and about things of the past. But I think "The Willows" is more remarkable for its suggestion of contact between different physical dimensions, a scientific idea, an idea of the future, and one for science fiction writers to treat. I feel certain that Blackwood read and understood at some level Edwin A. Abbott's novella Flatland: A Romance of Many Dimensions, first published in 1884. But did he also know of Albert Einstein's theory of special relativity, postulated in book form in 1905, only two years before "The Willows" was published? Or did he simply have an intuition that allowed him to envision the existence of other dimensions beyond our own? (We have seen the artist's intuition at work before in Eleanor Cameron's books about the Mushroom Planet.) Setting all of that aside, there have been, more recently, theorists of a so-called genre or sub-genre "dark fantasy." Academic Gary Hoppenstand believes that dark fantasy was invented by Francis Stevens. I have a different opinion. If there is such a thing as dark fantasy--a big if--then it seems more likely to me that H.P. Lovecraft was a pioneer in that genre or sub-genre. But I think "The Willows" may push the origins of dark fantasy back even farther, at least to 1907. More likely still, dark fantasy grew out of fantasy, folklore, mythology, and organized religion, all much older forms. (5) Don't be confused by Hoffer's use of the word liberal. He meant liberal in the classical sense, i.e., a person who believes and understands that human beings are and by rights free. In current usage, liberal usually means the opposite, i.e., a progressive, leftist, socialist, or statist who wants to grind humanity and human freedom under his boot. Put a mustache on Blackwood and he could have passed for Commander McBragg, that animated raconteur who told club stories in a time-honored way. In actuality, Commander McBragg was based on C. Aubrey Smith (1863-1948), a countryman and near contemporary of Algernon Blackwood.